If you're like me, and you've learned about "cowboys and Indians" from old movies, TV shows, and simplistic memes on the internet, you probably think that you know the real history of Indian people in Phoenix, Arizona. If you do know your Arizona history, you know that the Five Tribes Treaty of Peace was an alliance created in 1863 between the United States Military and the the five tribes, the Pima (Akimel O’odham), Maricopa (Pee Posh), Yuma, Hualapai, and Chemehuevi people, and has stood for over 150 years. It's celebrated every year at the Gila River Indian Community. Time-travel with me to what would someday be Arizona, and Phoenix. 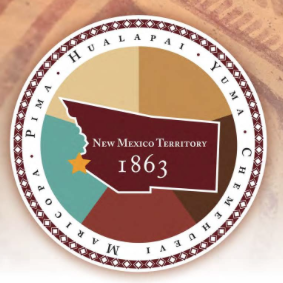 In 1863, it was the New Mexico Territory. To say that things were a mess would be a terrible understatement. The United States was in the middle of a civil war, and the Indian tribes of the southwest were engaged in a terrible war, as well. How anyone could actually be living in the Sonoran Desert at that time just puzzles me. But Indian people were living there, especially the Pimas, whose territory spanned from Mexico to the Gila River (which is just south of Phoenix). And the Salt River Valley, which is where Phoenix is, was empty. The people who had farmed there hundreds of years ago, the Hohokams, had long since gone. The Salt River ebbed and flowed, as it has been doing for thousands of years, but the people were gone. When people did visit the Salt River Valley, it was a battlefield. No, I'm not going to write anything about that here in my blog, it's beyond horrible. If you've read Farrish, or McClintock, you know. This was a war that had gone on for generations between Indian tribes, and the word slaughter understates it. When the United States Military arrived, the goal was peace. And that meant uniting as many tribes as possible. From what I've read, it seemed an impossible dream. But it was done, and it became an alliance. It took many more generations, but peace came to the Salt River Valley. And in 1891, the United States built an Indian School in Phoenix, which would continue that alliance.